Things unattempted yet in prose or rhyme." Samuel Johnson declared that Paradise Lost is "a poem …… which respect to design may claim the first place, and with respect to performance, the second, among the productions of the human mind ….." It is a poem about the rebellion in Heaven and the ejection of the fallen Angels; it is about the Garden of Eden, the deception of the snake, and the fall of Man. But it is much more than all these points, separately and as a whole. Just as Satan falls into the depths of the burning pit of Hell, Milton delves into the depths of the human Soul and conversely soars to the heights of the God of Heaven, weaving a tapestry of images and profundity that will leave the reader amazed and speechless. Initially, the reader believes he is following Milton's lead, not realizing until later that he is part of the tapestry itself and Milton's words have become part of his soul. 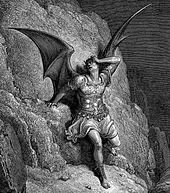 In this poem, Satan's actions are especially shockingly compelling as we follow his fall from Heaven, his brash, swaggering leadership of the fallen angels, and then his quest to best God to get his spiteful, yet senseless, vengeance. We think of Hell as a place, full of fire and brimstone, burning and torment, and while Milton gives Hell a location in this poem, it is much more than that. Satan carries Hell inside him. It torments him, not only with thoughts of rage and hate and revenge, but almost more effectively with thoughts of despair, regret and impossible hope. Conflicting emotions scrape and tear at him incessantly. For him, Hell is not external; it is an internal condition from which he cannot escape. "No one had in fact done anything to Satan; he was not hungry, nor over-tasked, nor removed from this place, nor shunned, nor hated ---- he only thought himself impaired. In the midst of a world of light and love, of song and feast and dance, he could find nothing to think of more interesting than his own prestige …..
……. From hero to general, from general to politician, from politician to secret service agent, and thence to a thing that peers in at bedroom or bathroom windows, and thence to a toad, and finally to a snake ------- such is the progress of Satan. This progress, misunderstood, has given rise to the belief that Milton began by making Satan more glorious than he intended and then, too late, attempted to rectify the error. But such an unerring picture of the 'sense of injured merit' in its actual operations upon character cannot have come about by blundering and accident. We need not doubt that it was the poet's intention to be fair to evil, to give it a run for its money ---- to show it first at the height, with all its rants and melodrama and 'Godlike imitated state' about it, and then to trace what actually becomes of such self-intoxication when it encounters reality." "It (Paradise Lost) suffers from a grave structural flaw. Milton, like Virgil, though telling a short story about the remote past, wishes our minds to be carried to the later results of that story. But he does this less skillfully than Virgil. Not content with following his master in the use of occasional prophecies, allusions, and reflections, he makes his two last books into a brief outline of sacred history from the Fall to the Last Day. Such an untransmuted lump of futurity, coming in a position so momentous for the structural effect of the whole work, is inartistic. And what makes it worse is that the actual writing in this passage is curiously bad. There are fine moments, and a great recovery at the very end. But again and again, as we read his account of Abraham or of the Exodus or of the Passion, we find ourselves saying, as Johnson said of the ballad, 'the story cannot possibly be told in a manner that shall make less impression on the mind'. ………. If we stick to what we know we must be content to say that Milton's talent temporarily failed him ……." This was a massive achievement reading Paradise Lost and writing several reviews. I enjoyed your comments but had difficulty connecting to all the quotes. During such a reading adventure I was curious what your 'personal feelings' were while reading. Often I need just to shout out ( on paper) : "this is too much...I need a cup of coffee!" 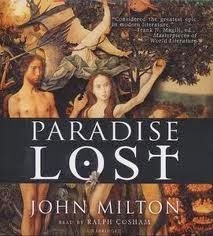 Again, this was quite a challenge, congratulations for reading "Paradise Lost'! Ah yes, during read-alongs because I'm giving so much information, I do tend to try to leave my personal feelings to my comments because I don't want to sway people one way or another; I hope that they will be able to experience the book on their own terms. I do think I give my personal feelings at times but perhaps they are more "cloaked" for this reason. I think also because I tend to have extreme reactions either way that often mellow after I finish the book (because I've understood it better), I like to wait until the end to sum up how I've felt about it. I'm struggling with Candide (a present read-along) because I'm having strong feelings about it the further I read, yet I don't want to colour anyone else's experience and honestly, I'm not sure I'll feel the same by the end of the book. So I'm holding onto those feelings until I flesh them out more, KWIM? I actually found this process pleasurable so the posting was not overwhelming at all. My absolute enjoyment of the book helped as well. Milton's portrayal of Satan was mind-blowing. Yes, his other characters perhaps weren't as amazingly formed but honestly how easy would it be to portray characters with personalities you've never experienced in situations that are completely foreign. So in spite of these limitations, he did a great job with characterizing Adam and Eve, God and the Son. His verse is just beautiful and it was such …. well, it felt like an honour to get the chance to "visit" Eden and experience what it possibly could have been like, even it was just a taste of all of its glories. Satan's relationship with his fallen angels and their twisted and, at times delusional, reasoning was fascinating as well. Oh, when I read, I definitely jot down my personal thoughts with questions and often big exclamation marks. Great post! I love your selection of quotes. You can tell from your comments that you were moved by poem and it made an impression on you. Both in your comments on my blog and here, you've had some very interesting insights about Satan that I never would have realized. It was such a pleasure to read Paradise Lost together, I hope you get the opportunity to join us for Madame Bovary. Thanks so much, Ebook ……… I really enjoyed doing the read-along with you and our conversations. You made so many great observations in your posts that really got me thinking. I am soooooo tempted by the Madame Bovary read-along. I have a few days off coming up so if I can clear my schedule a little it might just be doable. It would be lots of fun to join in! Wow, Fariba! Thanks so much and also for your kind words. I will check it out. Oh, if you've read Dante, you should do fine with Paradise Lost. What is nice about PL is that most readers already have the outline of the story so you just have to concentrate on filling in the details. Cleo...your review made me so want to go back to college and get my Classical Poetry Professor take a look at it. I remember Lewis's essay on Paradise Lost and I remember completely disagreeing with it. I argued and we can do this over mail or some other form than over your blog, if Saturn in Paradise Lost is "a villain', he is a villain of the same genre as Macbeth and Hamlet. I agree he is flawed, but is it really so despicable to question the status quo. Furthermore isn't Milton and The Old Testament God a bit of a Fascist in not allowing freedom of speech and fair voting (you know what I mean!) and finally like we all know hell was something Saturn carried with him - really if I had to carry "hell", I would ensure I gave back 'hell' to the one who gave me and somehow this was my reading of Paradise Lost. Excellent review! I am so IMPRESSED! I know of so FEW people who have ever read Milton "voluntarily"!!! You rock Cleo!! I really appreciate your thoughts and will have to mull them over. I would really need to go back and read MacBeth and Hamlet (I'm reading this at the end of the month) to compare though, but I will definitely keep this in mind. (in fact I think I'll be moving MacBeth up on my reading list). I think when I was reading PL, along with the story, I was trying to take into account who wrote it. There is a hierarchical structure in heaven, which mirrored the monarchical structure of Milton's times. When comparing his political embroilment with Paradise Lost (and Satan), I think, that is why Blake questioned if he was of the devil's party. But monarchists also distinguished between a ruler and a tyrant, so I think Milton made a choice politically, yet never meant Satan to be heroic. He was actually trying to communicate how appalling he was, but perhaps did too good a job. And getting back to Satan, he didn't just say, excuse me God, I think things are unfair; he started a war. And not just a war because he wanted a few changes, but a war because he wanted full power. So I don't think God's response was at all unfair or unexpected. And THEN, just because he lost the war he wants revenge and then revenge on two innocent people just to get at someone else. I think that's despicable. God didn't give Satan hell, Satan gave it to himself, all from the choices he made, which was another fascinating aspect of the poem. I think Milton's portrayals of God, the Son and Adam and Eve, were weak, especially the former two. But for what he attempted in its scope, I say "Bravo"! I think the result is excellent. Thanks for you kind words! I always enjoy hearing your comments!